This is a Guest Post from Coach Brent Wasche, a Texas High School Football Coach. If you would like to write for Joe Daniel Football, check the information at the end of this article. Time. There is never enough of it, especially if you are a football coach trying to balance work, family, and preparing your team for next week’s game. With the amount of technology available a coach can spend endless hours watching, analyzing and breaking down an opponent. While I’ll never call those hours wasted, it’s easy to let time slip away if you don’t attack your film breakdown as an intentional process. Having coached all over the country I realize that many coaches don’t have the luxury of having a complete and fully dedicated defensive staff so it becomes even more important to prioritize your defensive game film breakdown so that you don’t find yourself getting behind the clock in your game plan. 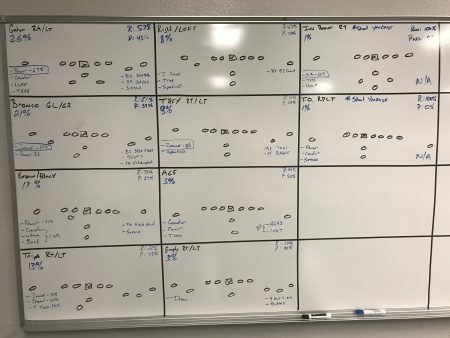 This article will serve to help coaches decide how to best utilize their limited resources and how to approach game film breakdown to maximize the benefit of the time they invest. The article is not meant to discuss the topic of tagging or labeling your defensive game film, which is another labor intensive process that I will attempt to cover in the near future. 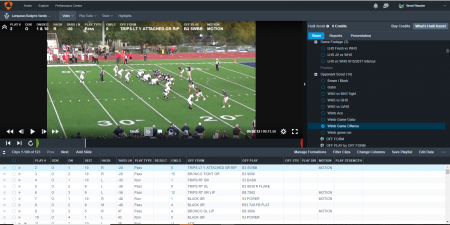 I will say that for those coaches short on time or staff, that you look into utilizing the services of HUDL assist to help you in this process. How many games you decided to tag and breakdown is up to you, your staff and the time you have available. I would suggest that you breakdown at least the previous two games. However you should still watch any other available film to look for tricks, injuries, or changes in scheme that may have developed throughout the year. Ideally these games will have been played against a team that runs a similar defensive front. However generally what games we see is usually dictated by the films selected by the offense. What Concepts Do They Run? The first things we need to identify is what offensive concepts the offense wants to run. Whether it’s Power, Zone, Buck Sweep, Belly, Trap or Veer. Your defense needs to be ready to fit to and defend those plays. Identifying your opponent’s top 4 or 5 run and passing concepts will give you guidance on how to develop your game plan, how to ration out the time in your practice schedule, what play cards need to be drawn up for your scout book, and the frequency the concepts should be shown in your defensive team sessions. Ultimately we want to ensure that the time you spend in practice that week is spent defending what you’ll see on Friday night. You want to know that your run fits are sound, and your coverage is adequate to defend what the team you’ll see that week wants to run. Nothing will pay higher dividends than identifying and game planning around your opponent’s base concepts. The old adage is that “we defend plays and not formations”. 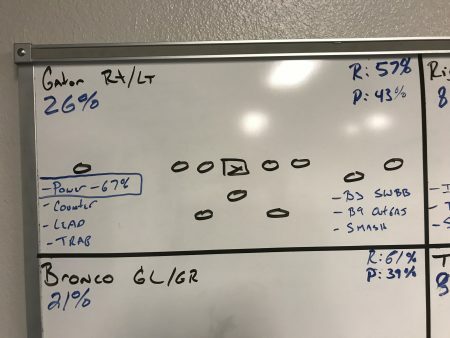 While this is true, directly after identifying play concepts you and your defensive staff needs to take a solid look at what formations your opponent runs so that your defense isn’t getting beat by alignment pre-snap. Along with ensuring that you can line up soundly, identifying your opponents formations as a staff and working a formation recognition period into your practice schedule will help your athletes process the pre-snap information faster. Remember if they are confused about how to align to a formation they will be confused about their assignments. Other key factors you should look at when evaluating formation is do they have a common formation they run on the goal line or short yardage situations. Many teams like to transition to Tandem, Power I or Wildcat sets in these situations so you will need to ensure your defense is able to align to each new set. When breaking down personnel you need to take a look at who is on the field. We start this process by with a simple position chart in which we will write down the number of each player starting the game and major contributors at each position. Having this information during a game is handy because it can help you to identify potential weak spots if an opponent has a backup in the game for one reason or another. While these changes are easy to recognize at QB or RB often time they can go unnoticed when they occur on the offensive line and a defense may lose an opportunity to expose a potential weak link. Who is there best player and how are they trying to incorporate him into the offense? Does he play on Defense or Special Teams as well? Who is the primary receiver(s)? Who is the best / worst offensive lineman and do they give away a run strength by trying to run behind one kid? Who do we want to attack with the blitz? Do they flip their line? Do they bring in alternate personnel for specific packages, such as goal line or 5 wide sets? I have listed tendency last on purpose, simply because I feel that this is an area in which many defensive staffs can waste time fishing for things that may or may not be there. That doesn’t mean that you shouldn’t look for them, just know that a good OC will self-scout and tendency will be very hard to find; therefore it should be last on your list of priorities. I put much higher stock in making sure your defense can both align and defend the things you know your opponent likes to do. 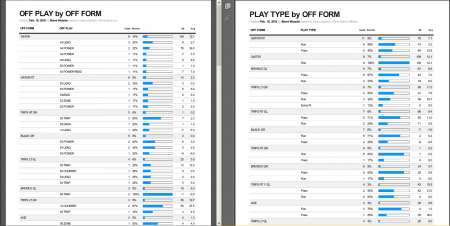 That being said there are some simple tools you can use in HUDL reports to see of your opponent is showing his hand. The following reports can be ran fairly quickly and can possibly help you to identify any potential keys. Brent Wasche has been coaching high school football for the past 9 years in Texas and Washington State. 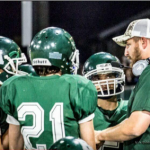 He currently serves as the Outside Linebackers coach at Lampasas High School in Lampasas, Texas and has previously served as the Defensive Coordinator at Port Angeles High School in Washington State. You can find Coach Wasche on twitter @coachwasche.